Agriculture and drinking water are among top ten priorities for voters all over India, way above defence and terrorism issues, according to a survey by the Association for Democratic Reforms. In urban areas, drinking water, pollution, traffic congestion and garbage clearance are top concerns for voters, reveals the survey. India goes to the polls next month and while environment is not the number one priority for voters, it does feature among the major issues that voters, especially in urban areas, are concerned about. 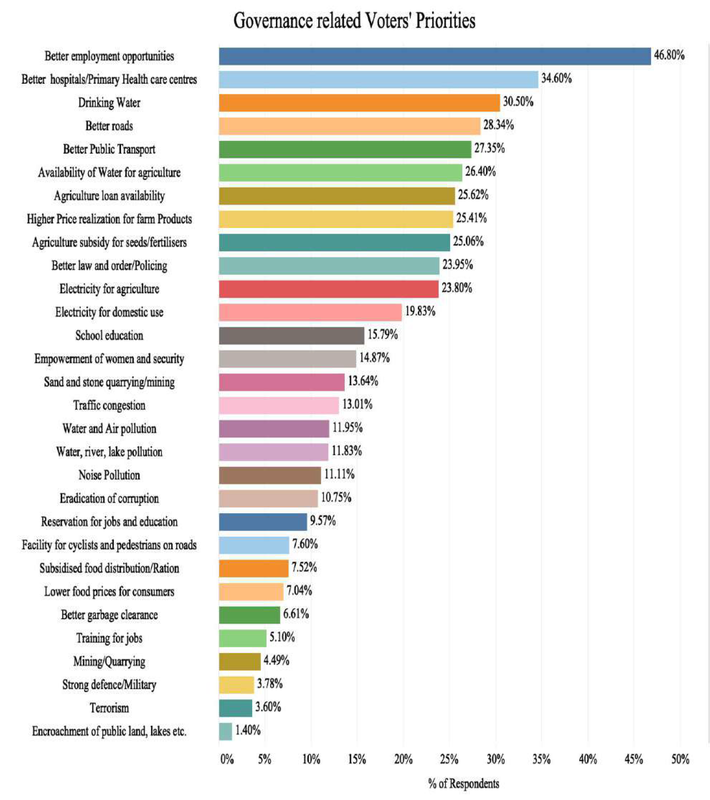 Agriculture-related governance issues and clean drinking water feature predominantly in the Indian voter’s priorities for the coming elections, reveals a survey. Meanwhile, high levels of water and air pollution, which have been plaguing Indian cities over the past few years, are not a top priority nationally but are of importance to the urban voters. The survey released by the Association for Democratic Reforms (ADR) on March 25 revealed that the availability of water for agriculture, agriculture loan availability, higher price realisation for farm products and agriculture subsidy for seeds/fertilisers are among the top ten concerns for voters in India. Water and air pollution is a priority for only 11.95 percent of the voters in the survey (urban and rural) and ranked 17th in the list of 31 governance related priorities for all-India voters, though it featured in the top ten priorities in urban areas. To analyse the voters’ priorities, a total of 273,487 people were interviewed across 534 Lok Sabha constituencies (at least 500 respondents in each constituency) during October-December 2018. The 2019 Lok Sabha elections are scheduled to take place in April-May 2019. The survey found that Indian voters prioritise employment and basic amenities (like healthcare, drinking water and better roads) above all governance issues (including terrorism and strong defence/military). Drinking water was ranked third (30.50 percent respondents), behind employment and healthcare, among the top 10 voter priorities in the country. In fact, the survey noted that the significance of drinking water as voters’ priority this year has increased by 150 percent from last year. However, in rural areas, drinking water was ranked seventh, after agricultural issues which are dominating the priorities of rural voters. Better roads were ranked fourth (28.34 percent) and better public transport was fifth (27.35 percent) in the national rankings. Ranking of governance issues, as per voters’ priorities. Graph by Association of Democratic Reforms. Other environment-related concerns that found a place in the list of top priorities for voters’ were sand and stone quarrying (ranked 15), traffic congestion (ranked 16), river/lake pollution (18) and noise pollution (19). The issue of facilities for cyclists and pedestrians and garbage clearance also figured in the list at rank 22 (7.6 percent) and 25 (6.61 percent) respectively. In rural areas, better public transport, water, river and lake pollution, and garbage clearance were higher in the list of voters’ priorities, ranked ninth, 12th and 21st respectively. The majority of voters in India are from rural areas, with over 300 of the 543 seats in the Lok Sabha from rural India. The survey also analysed the voters’ ratings of the government’s performance and found that “voters rated the performance of the government on all 31 listed governance issues as below average.” But, the worst performance of the government, as rated by the voters, was on the issues of encroachment of public lands and lakes. In urban areas, environmental issues featured significantly in the priority list, after employment and healthcare. It is estimated that urban/semi-urban areas account for about 200 of the 543 Lok Sabha seats. The issue of traffic congestion (3), drinking water (4), water and air pollution (6), better public transport (7) and noise pollution (8) were ranked among the top 10 priorities for voters. These were followed by facilities for cyclists and pedestrians on roads (11) and better garbage clearance (17). As per the survey, traffic congestion was a priority for 37.17 percent of the voters surveyed in the urban areas, drinking water for 35.03 percent, better roads for 34.91 percent, and water and air pollution for 34.14 percent of the voters. “Surprisingly, despite the scarcity of land in urban areas, encroachment of land, lakes etc. was not a priority for urban voters as it was ranked lowest at 1.26 percent,” said the survey. In rural areas as well, this issue was ranked lowest in the list of issues that concern voters. Read more: Will urban outrage over environmental apathy reflect in voting? Among the states, drinking water was the highest priority for voters in Karnataka, Andhra Pradesh and Kerala. The top states where better public transport was the highest voters’ priority were Kerala, Chhattisgarh and Rajasthan and where the availability of water for agriculture was the highest voters’ priority were Bihar, Chhattisgarh and Odisha. Drinking water came up as a significant priority for voters across the country. The survey emphasised that more than 163 million Indians do not have access to safe drinking water, as per a recent report of the Comptroller and Auditor General (CAG) of India. Besides the National Rural Drinking Water Programme has also failed in achieving its targets despite spending 90 percent of Rs. 890.95 billion (Rs 89,956 crores) budget over five years till 2017. “All over India, 30.5 percent voters consider drinking water as the third most important governance issue. It is particularly higher for urban voters, voters from medium wealth group and for general category voters,” the survey said. The survey emphasised that water is undeniably an essential resource for agriculture but it has not been well-managed in the Indian context, despite the country being an agricultural powerhouse. “Problems of Indian agriculture are intricately linked to per-capita availability of water in a cost-effective manner since nearly 70 percent of the net sown area is rain-dependent. All over India, 26.40 percent voters consider availability of water for agriculture as the sixth most important governance issue,” said the survey. The ADR analysis also revealed that agriculture-related issues like agricultural loan availability (ranked 3rd in 2017 and 7th in 2018), agriculture subsidy for seeds/fertilisers (ranked 6th in 2017 and 9th in 2018), electricity for agriculture (ranked 11th in 2017 and 5th in 2018), availability of water for agriculture (ranked 10th in 2017 and 6th in 2018) continue to be featured among the top most voters’ priorities across both, 2017 and 2018 surveys. The survey was conducted in 534 constituencies with at least 500 respondents in each constituency. It found that water and air pollution, while not a national level priority, were among the top three voters’ priorities in at least 45 constituencies across the country. In the capital, Delhi, however, where pollution has been an important issue for years, four of the seven constituencies rated it in their top three priorities while traffic congestion was a priority issue for all the seven constituencies. Graph by Association of Democratic Reforms. Similarly, drinking water was among the top three priorities for voters in 86 of the total 534 constituencies surveyed, traffic congestion in 88 constituencies while the issue of availability of water for agriculture was among the top three priorities in 154 constituencies. The survey revealed interesting data from across India. Goa, for example, was the only state with constituencies opting for garbage clearance among their top three priorities. Additionally, noise pollution, which does not usually get as much attention as air or water pollution, was infact among the top three priorities in atleast 20 constituencies in the country. This is the third such survey released by ADR. The first survey was conducted before the 2014 elections while the second one was done in 2016-17. Banner image: A boy washing his face in a polluted river in Chhattisgarh. Photo by Sri Kolari/Greenpeace.